Land ownership records in Hamilton County can be found in the Recorder's Office. This office was established in April 1794 when all of Ohio was divided into only two counties. Present Hamilton County lines were established about 1805. This office records, preserves and makes available for inspection documents relating to real estate and other personal records. Real estate involves not only the sale, lease or transfer of property, but also encumbrances (such as mortgages and liens) that would either block or affect the title of a piece of property. All deeds, mortgages, leases, mechanic liens and releases have survived various courthouse fires since 1794. Some have been recopied due to wear and tear. The Recorder's Office has an overview guide to property research. Books on Hamilton County property listed below are available at the Public Library of Cincinnati and Hamilton County (PLCH). Recorder's Office records and indexes of most interest to genealogists and historians are also available in the Cincinnati History Library and Archives (CHLA) on over 1,300 microfilms. Hamilton County land research can be difficult. With Bill Graver's kind permission, from his exhaustive guidebook, here is an overview guide to the surveys listed below. Miami (Symmes) Purchase - between the Great and Little Miami rivers, 1788 grant to John Symmes. Virginia Military District - 1784, land grants to "pay" Revolutionary War soldiers. Congress Lands - 1795, land between the Indiana state line and Great Miami River. From 1794 to 1823, deeds and all other types of documents were recorded in deed books "A" through "W2." Because people didn't go right to the courthouse and sometimes there were so many deeds to handle, deeds were recorded in different books on the same day. So any date ranges given for books are approximate years. The first numerical book, 20, was to be the first mortgage book. When deed book "W2" was full, deeds were recorded in new book 21. This process was continued, new books alternating between deeds and mortgages, until 1858 when there was a book 239 created for both deeds and mortgages. From then on the numbering was continuous for both as shown in this list. Bill Graver has created a list of deeds and mortgages in his guidebook. Deed books 21 (1823) through 400 (1872) are online at Recorders Office. Books 477 (1877) through 854 (1901) have been digitized and are online at FamilySearch. Click on Browse, then Land and Property Records. Alma Aicholtz Smith, Ohio Lands: Hamilton County Deed Book A, 1787-1797, Territory Northwest of the River Ohio (1992). Main Library (929.377177 qS642) and circulating copy available. Describes Symmes Purchase, Virginia Military District, Congress Lands (west of Great Miami River), reference maps, bibliography, settlement and formation of Hamilton County, Recorder's Office indexes description, detailed abstracts of deeds. William H. Graver and Eileen Mullen, Hamilton County, Ohio, Index of Early Deed Books: 1804-1806 and 1814-1817 (2004). PLCH: 929.377177 qG775d; CHLA: GENERAL f929.37714 G775d, R. R.
Deed surname indexes: Indexes #1 through 8 (1787-1869) are on microfilm at the Recorder's Office or CHLA. Recorder's Office (HCRO) Deed Indexes. Some deed indexes by name of grantee or grantor, #9 through 21a (1869-1904), have been digitized and are online at FamilySearch. Click on Browse, then Land and Property Records. Indexes after 1904 to 1988 are on microfilm at the Recorder's Office or CHLA. Deeds created after 1988 are online at the Recorder's Office. Deed geographical indexes: Geographical, location or "by-area" indexes to deeds go back to the beginning of the county. The current set, Series 8 (1938-1988), is in physical books at the Recorder's Office. Series 1 through 7 is on microfilm and online at the Recorder's Office. Series 1 through Series 7 (1794-1938) have been digitized and are online at FamilySearch. Click on Browse, then Land and Property Records. From 1794 to 1823, mortgages were recorded in deed books "A" through "W2." The first numerical book, 21, was the first separate mortgage book. When deed book "W2" was full, deeds were recorded in new book 21. New mortgage book numbers alternated with deed book numbers until 1858, when there was a book 239 created for both deeds and mortgages. From then on the numbering was continuous for both as shown in this list. Bill Graver has created a list of deeds and mortgages in his guidebook. Mortgage Books 20 (1823) through 715 (1896) have been digitized and are online at FamilySearch. Click on Browse, then Land and Property Records. All books from # 20 (1823) thru #300 (May 1869) are now available online at the Recorder's Office. The book numbers from 20 to 240 are not consecutive. Those available as of September 1, 2017 are: 1820's: 20, 27, 31. 1830's: 36, 37, 40, 45, 48, 51, 54, 57, 60, 63, 66, 69, 74. 1840's: 77, 80, 83, 86, 89, 95, 98,103, 106, 110, 113, 118, 121, 124, 126, 131, 132, 135, 140, 141, 144, 147, 149. 1850-1869:152, 156, 157, 160, 161, 164, 167, 170, 172, 174, 177, 180, 183, 184, 188, 193, 194, 196, 198, 203, 204, 207, 210, 213, 215, 217, 221, 222, 225, 226, 229, 230, 234, 238-300. Mortgage indexes: Use Deed Index books for 1794 to 1823. From 1823 to 1898, the mortgage books have no direct index. Between 1898 and 1929, there is an index at the rear of each mortgage book. From 1929 to 1988, there are 16 microfilm indexes labeled "Mortgagor Index A-BUC, BUD- .... etc." These indexes are only at the Recorder's Office or CHLA. No indexes by name of mortgagor or mortgagee have been digitized or are online. From 1794 to 1848, leases were recorded in deed books "A" through "W2" and #21 through 142. The leases from the 1794 to 1823 deed index have been extracted in this finding aid:. The first separate lease book, #1, was started in 1848. From then on to 1988, the numbering was continuous as shown in this list. Lease Books 1 (1848) through 122 (1902) and Lease Indexes 1, 2 and 3 (1858-1901) have been digitized and are online at FamilySearch. Click on Browse, then Land and Property Records. Books 1-122 are also available online at the Recorder's Office. Lease indexes: Use Deed Book Indexes #1 through #4 for 1794 to 1848. In many index entries (not all) the word Lease or abbreviation Ls is written next to the buyer or seller's name. The original deed index images as well as the HCGS buyer total alphabetic finding aid (1844-1869) can be accessed from the link "HCRO Deed Indexes" on the menu panel at the left. There are no originak indexes for Lease books #1 to 4 (1843-1858). From 1874 to 1901, see Lease Index 2 (1874-1898) and index 3 (1898-1901). From 1901 to 1931, see index in each book. From 1931 to 1971, see Lease Index 1931-1949, 1949-1955 and 1955-1971. These indexes are on microfilm at the Recorder's Office or CHLA. Finding Aid. H.C.G.S. volunteers indexed books 1,2,3 & 5 and transcribed lessee (renters) surnames (11,700+) from original lease index 1, then sorted alphabetical by lessee surnames in the following PDF file which is every word searchable. Search for lessor surnames and other names after the PDF file is opened. To get search box, hold down Ctrl key and letter "F". From 1794 to 1823, liens were recorded in deed books "A" through "W2." From 1823 to 1843, mechanic liens were recorded in mortgage books #20-90. The first separate lien book, #1, was started in 1843. Lien books 1 through 21 (1843-1903) are online at Recorders Office. Lien books 1 through 21 (1843-1903) are also online at FamilySearch. Click on Browse, then Land and Property Records. Lien books 1 through 21 (1843-1903) are also online at Recorders Office. From then on the numbering was continuous to 1988 as shown in this list. Lien indexes: Use Deed Index books for 1794 to 1823. There are no indexes for the mortgage books #20-90. There are only lien indexes for 1843-1847 and 1903-1978. These indexes are only on microfilm at the Recorder's Office or CHLA. From 1794 to 1823, mortgages and mechanic liens were recorded in Deed books. Later a note of release was written in the margin beside a debt when it was paid off. From 1823 to 1843, mortgage and liens were recorded in Mortgage books #20 to 90. As before, a note of release was written in the margin when a debt was paid. After 1843, mechanic liens were written in Mechanic Lien books 1 through 17 and mortgages in Mortgage Books #93-630. As before, a note of release would be written in the margins of both books as required.1 A list of release documents is available. Release indexes:1 For the period 1794 to 1823, the names of the debtor and the one he owed that were indexed in Deed Index books for the mortgage or lien also serve as an index to the release. From 1823 to 1843, since the release was written in the Mortgage books, which have no index, there are no release indexes. For 1843 to 1892, there are no direct indexes to either the mortgage or lien books, and therefore none for the releases. Separate Release Books began in 1892. Book #1, 1892-1905, has a separate index. It is on microfilm at the Recorder's Office or CHLA. After that time, names of the debtors only were indexed in release books #2-295. Mortgage Release books 1, 2 and 3 (1892-1949) have been digitized and are online at FamilySearch. Click on Browse, then Land and Property Records. The land in Hamilton County has been surveyed three different ways in three separate areas (see above). To trace property in the county, it is necessary to understand the nomenclature of how the sections are arranged and identified. This 1853 map illustrates the Range-Town-Section arrangement in Hamilton County. Before the townships were laid out, county property was arranged in areas called Ranges. Only entire Ranges were west of the Great Miami River, with entire Ranges and fractional Ranges east of the Great Miami River. Within the Ranges, a smaller grouping of sections was designated as Towns. This term has nothing to do with actual existing named towns, villages and cities within the county today. Within the Ranges were towns, numbered from 1 to 5. For areas not next to rivers or county boundaries, ideally there would be 36 sections to a Town, arranged in a 6 section by 6 section square. Because of the rivers and boundaries, some Towns contain a varied number of Sections. 1835 Hamilton County map shows Township names, Section numbers, Range and Town identification. Indexed in Hamilton County, Ohio, Index of People, Roads, Churches, etc. on 1835, 1847, 1848, 1869, and 1884 Maps & Atlases, by Wm. Graver and Mullen (Little Miami Books, Milford OH). Especially important are pages 4-7 where Bill has compared the maps and shows examples of how to utilize them. The Archives and Rare Books Library at the University of Cincinnati has old Cincinnati maps. 1 William H. Graver, Hamilton County, Ohio, Guide to Recorder's Indexes and Documents, 1794-1988, page 116. An exhaustive, detailed guide to all records at the Recorder's Office is Hamilton County, Ohio, Guide to Recorder's Indexes and Documents, 1794-1988, by William H. Graver (Little Miami Publishing, Milford Ohio, 2003). PLCH: 929.107207717 qG775h; CHLA: GENERAL 1929.37714 G775h, R.R. 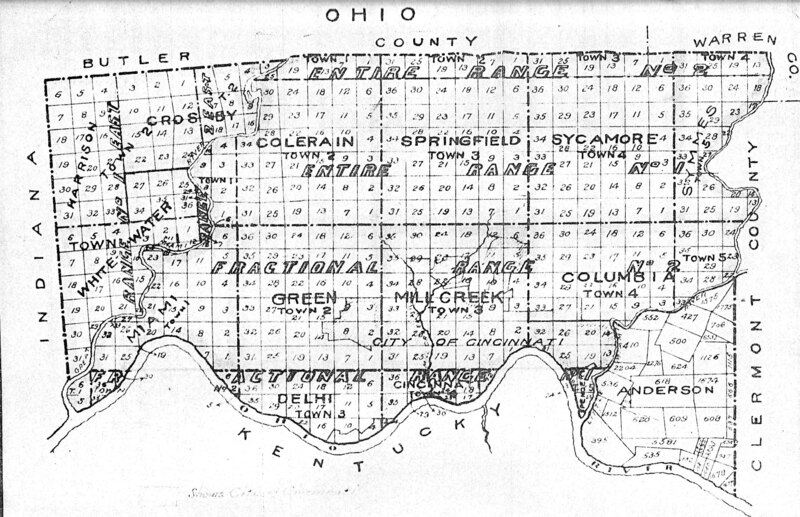 A must see for locating ancestors is Hamilton County, Ohio, Index of People, Roads, Churches, etc., on 1835, 1847, 1848, 1869 & 1884 Maps and Atlases, indexed by William H. Graver and Eileen Mullen (2005). PLCH: 929.377177 qG775p; CHLA: GENERAL f929.37714 G775m , R.R. Street Index to map of Cincinnati, Stewart Map Company (1914) R912.77199 fS85.2 Use with the 1914 map in the map cabinet. Index of property owners, real estate atlas of Cincinnati Ohio, The Sanborn Map Co. (1922) PLCH R912.77199 efS198a vol. 1, 2 Use with the Sanborn maps in the 3rd floor map cabinet. Unit land value maps for cities and villages, Hamilton County, with building index tables, by Robert Heuck, County Auditor (1931) R912.77199 fH22h 1931 Shows property lines with $/acre. For Cincinnati and Norwood. Index at back of book. Jim Dempsey, “Hamilton County Recorder’s Office - Far More Than Deeds,” The Tracer, November 2011. Jim Dempsey, "Hamilton County Recorder’s Office Early Indexes and Records," The Tracer, September 2012. Jim Dempsey, "Hamilton County Recorder’s Office Records to Be Added to FamilySearch," The Tracer, December 2013.